Lauren's want of the week... a Christmas jumper?! I'm feeling all Christmassy - I think it's due to the cold weather and the fact that I've booked off my Christmas break yay! But I really want a Christmas jumper to wear throughout the festive season and after chatting to some stylish friends I understand that this want is mutual so here's a round up of some gorgeous wintery knitwear, but without the naff-factor! This jumper is also from Zara and is £29.99 and is gorgeous with the 3/4 length sleeves. I love the reindeer! This lovely chunky cardy is from New Look and is £24.99. It also comes in cream and black. Finally, if you're really clever, you can knit this jumper. 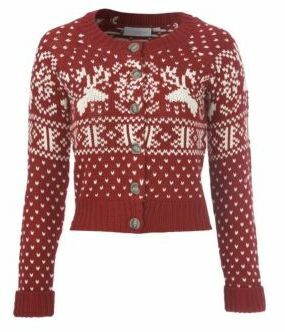 Are you a fan of Christmas jumpers or are they too cheesy for you? Are you going to get one this year? OMG these are amazing! i want them all!